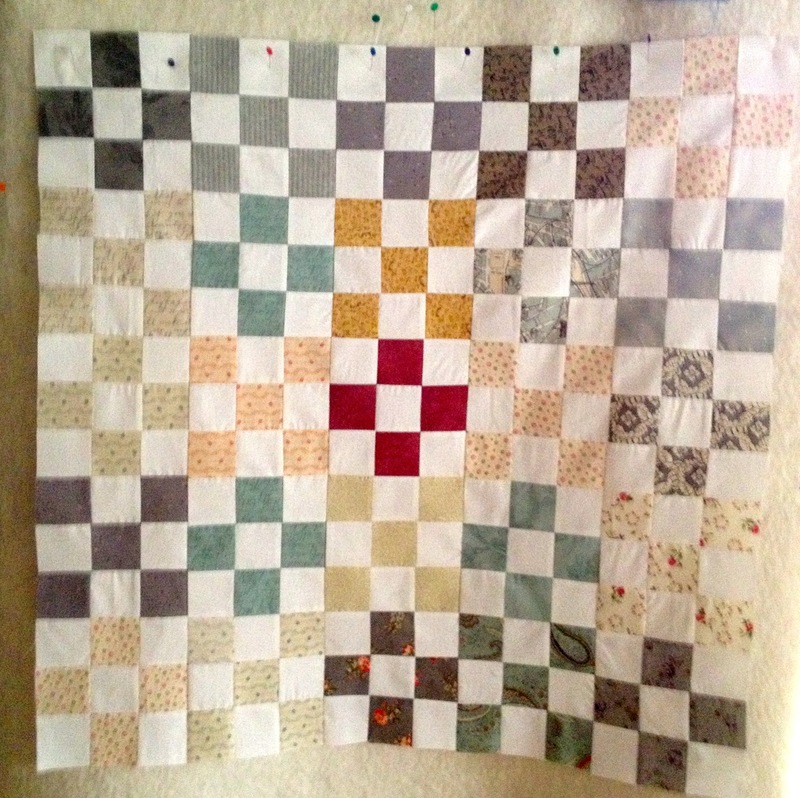 Last summer my friend Ann made a quilt using all little two and a half inch squares that she had cut from her scraps. So I started cutting up two and a half inch squares and keeping them in a box with that thought in mind. Then I saw this quilt made by Red pepper quilts on the 22nd of January, and I thought that with some white fabric I might have enough squares cut to make a little quilt. 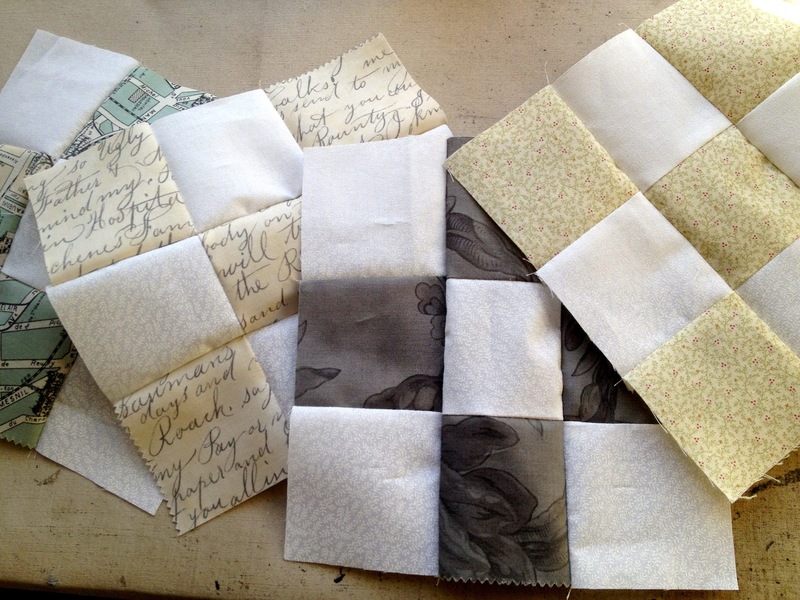 So with some white fabric left over from the quilt I made for my son and daughter-in-laws wedding, I started making little nine patch blocks. 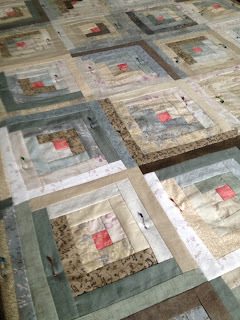 Nine patch blocks waiting to be ironed. I think these will need rearranging before I sew them together. Now to add borders and backing. 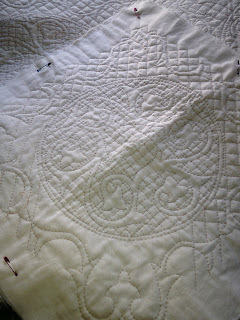 I chose some white fleece for the backing which I seem to have had forever, and then just quilted diagonally across all the white squares both ways. I found a binding already made up from the twin quilts I had made for Sunny Cottage about ten (yes ten) years ago. I always make up too much binding, then put it in a drawer as it will come in handy some time. Ha! 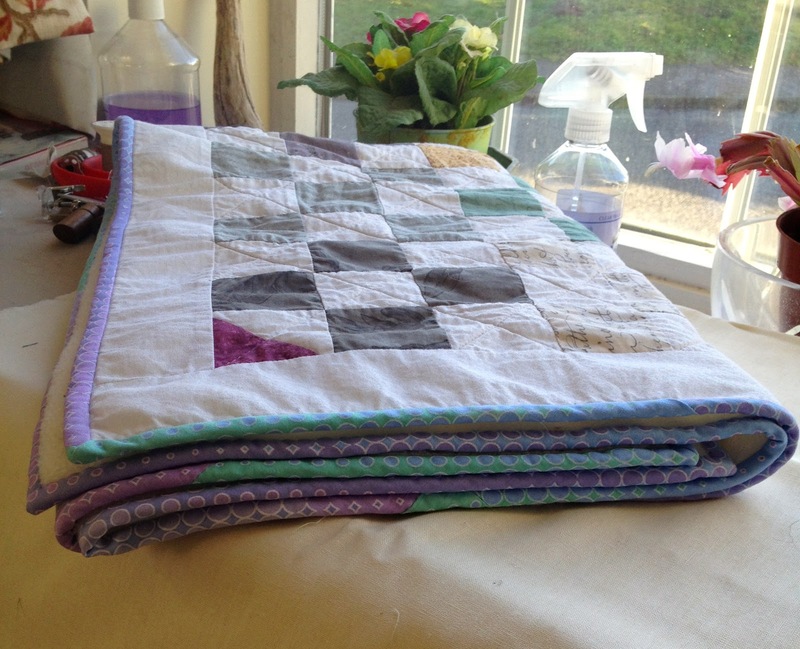 Well it was perfect for this little quilt. I just love sewing on the binding and hand stitching the back. 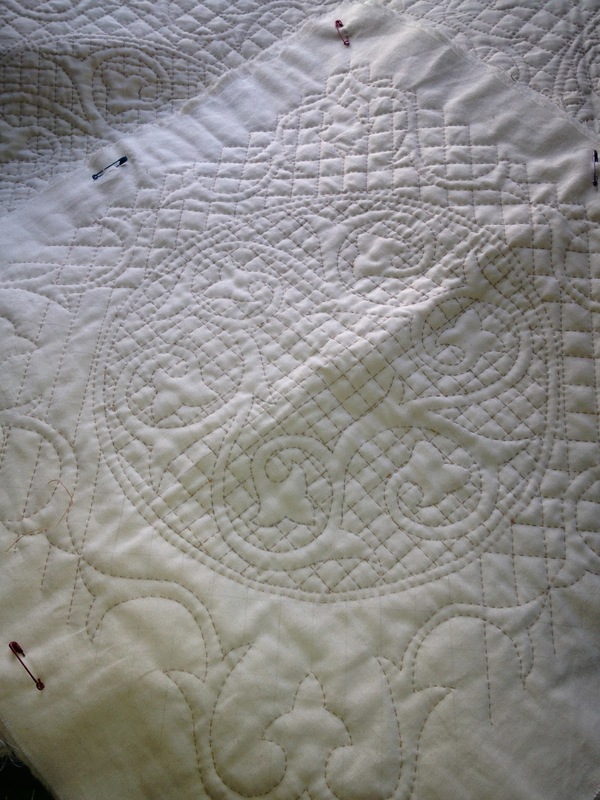 It's the best part of making a quilt. And then "Voila" straight into the washing machine to give it the "LOOK". 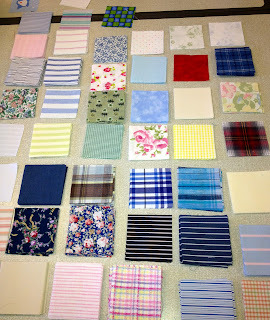 Well it did need washing, some of these fabrics I have had for a long time. 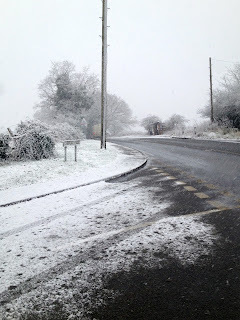 Well, the snow had cleared enough for most of use to get to Wednesday club, which is as you know held at Quilters Haven. It was so nice seeing each other again, every one was getting a little stir crazy at home. 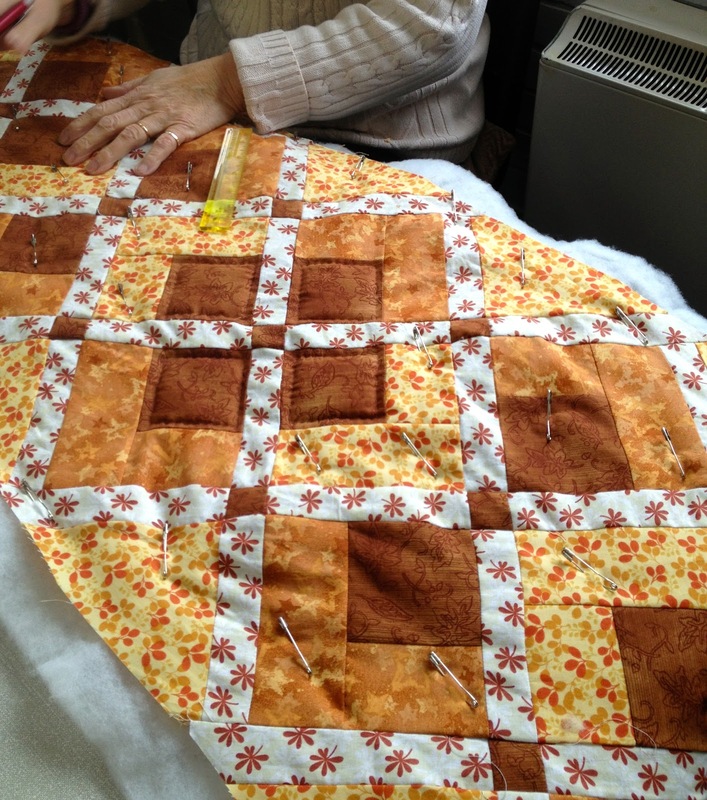 Me, I was so pleased to get my backing and wadding/ batting for my log cabin quilt, and yesterday spent my time basting it all together ready for quilting, and last night started on the quilting all snuggled up by the fire. "Heaven"
All the girls were working on different things, Sandra on the second of her twin grandson's quilts. 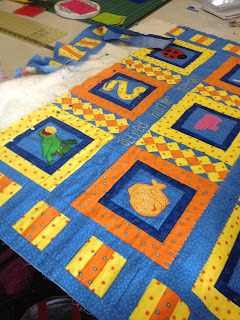 They are lovely and all hand appliquéd. 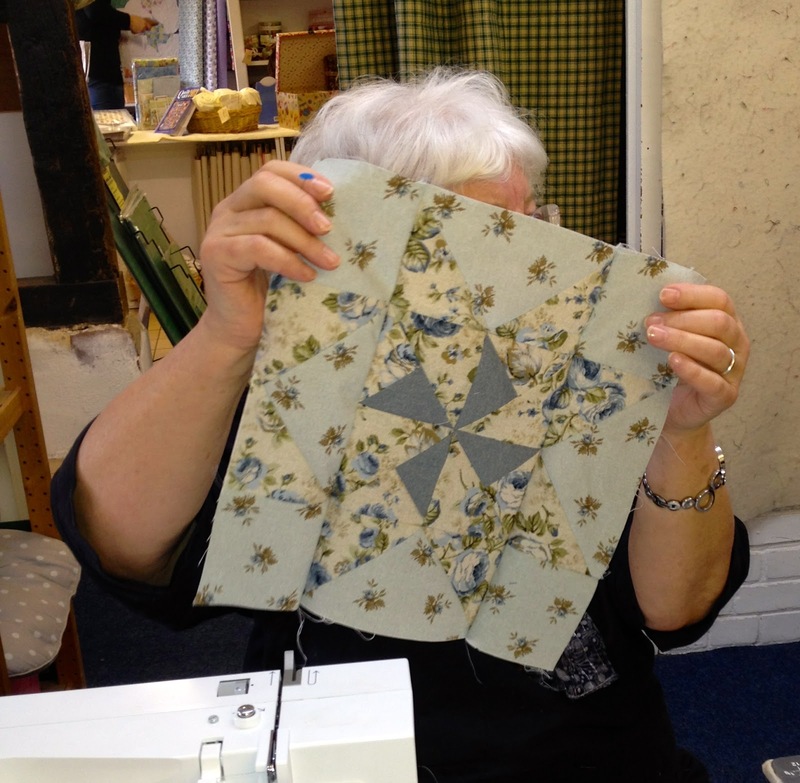 She is a fairly new to quilting but has lots of lovely ideas. 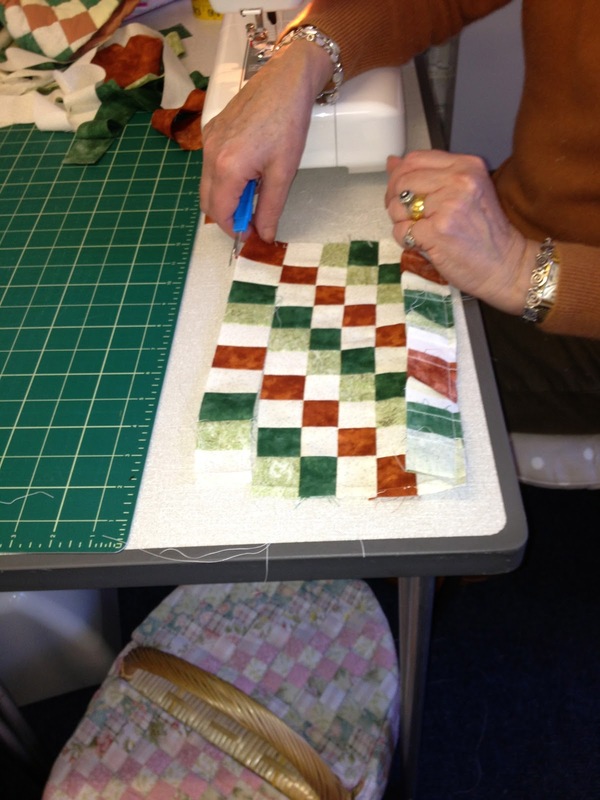 Maggie was well ahead of herself, making a table runner as a present for a friend for next Christmas! Jean had finished her star block for the Charity quilt that we are making from our scraps of the friendship quilts we all made last year. I loved the way she had put the centre of the star together, with tiny squares of scrap fabric. I took loads more photos at Wednesday club, but the rest were not so good, so will have to take some at the Bee next week. At Wednesday Club I was working on a UFO and when I was folding it up, Jenny stated it was "the epitome of sludge." Am I cross about that? No not at all, both Jenny and I love sludge colours LOL.. Yesterday evening, I sat looking through my new knitting book and thought I might make my self the lovely Hoody in it. It was going to be the hat on the cover, but as my lovely husband bought me a rather nice grey sheepskin hat for Christmas, I thought I was more in need of a nice warm cardigan.so I have ordered the wool from my friend Anj at Meadow Yarns and now have to wait till it comes. No sewing to show you, but thought you might like to see the little goblin that sits on the roof of what used to be my Pottery, till I retired and just did my warmer hobbies ie:- knitting and sewing. Ha! Ha! He looks a little perplexed at all the snow. I looked out of the kitchen window at him the morning and he is even more covered up. 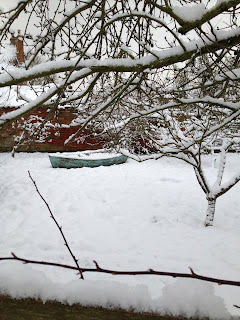 Oh dear, when will this snow go, soon I hope. Not sure if there will be any Wednesday Club tomorrow..
Keep safe and keep stitching...Doti.. 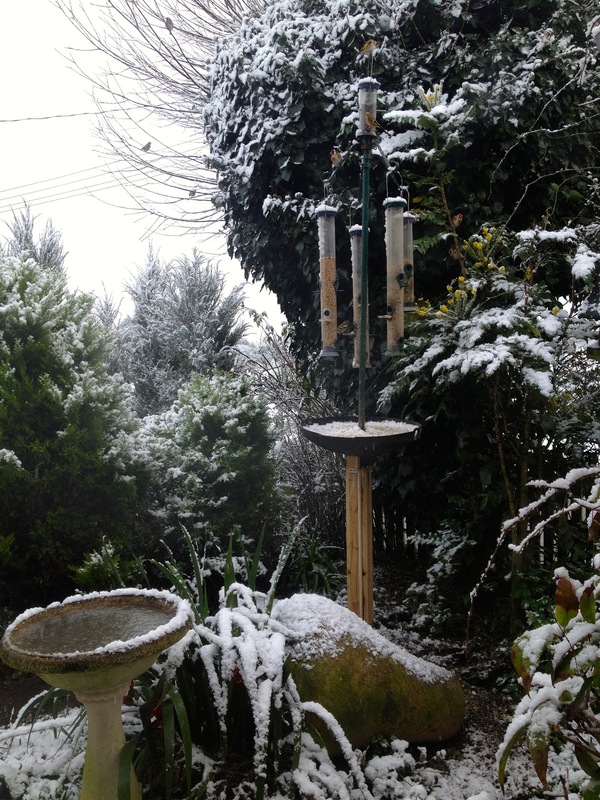 Yes its still snowing here in Suffolk UK, though it does look lovely. It's very cold so I am staying in, keeping warm and getting on with knitting and sewing jobs. 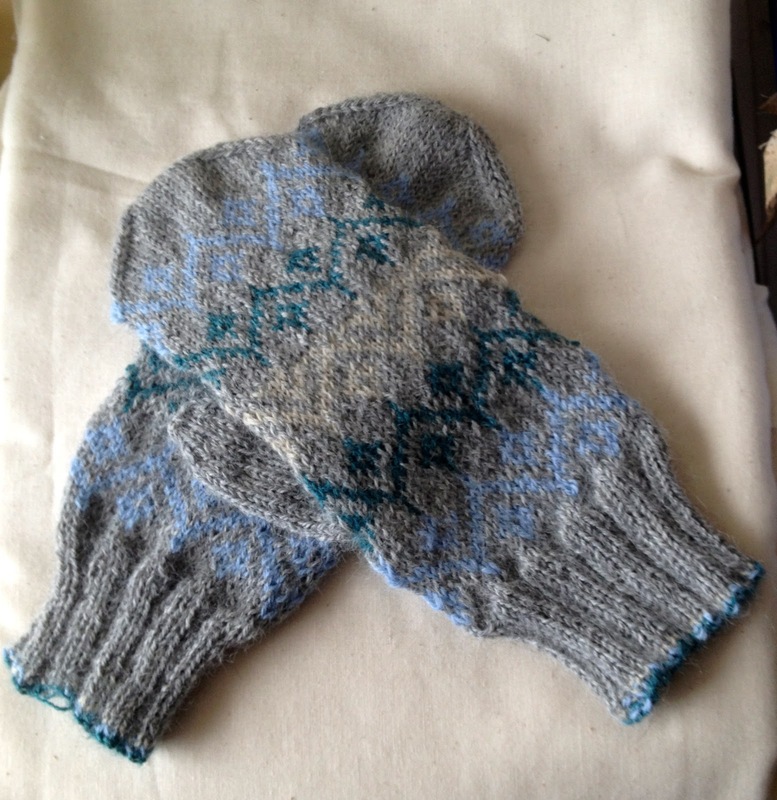 I am well pleased with my lovely warm Alpaca mittens, and they were made with scraps from my wool basket. 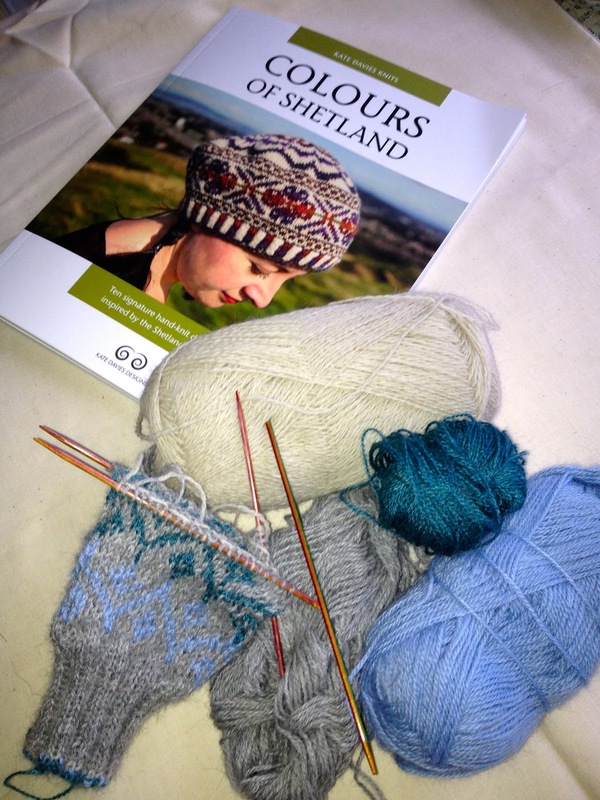 I now have to order some wool from my friend +Anj of Meadow yarns, as I would love to knit a hat from the book Colours of Shetland that I mentioned in my last post. 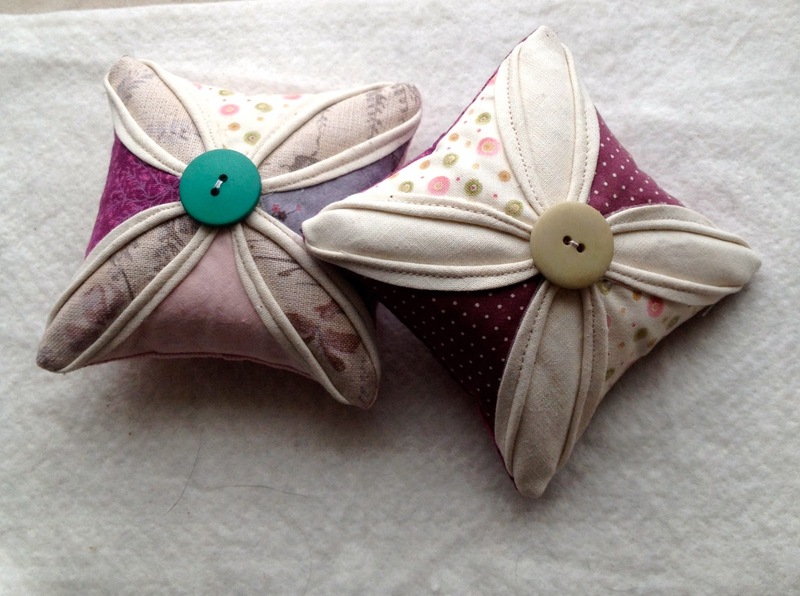 Here are two little pin cushions I made yesterday. 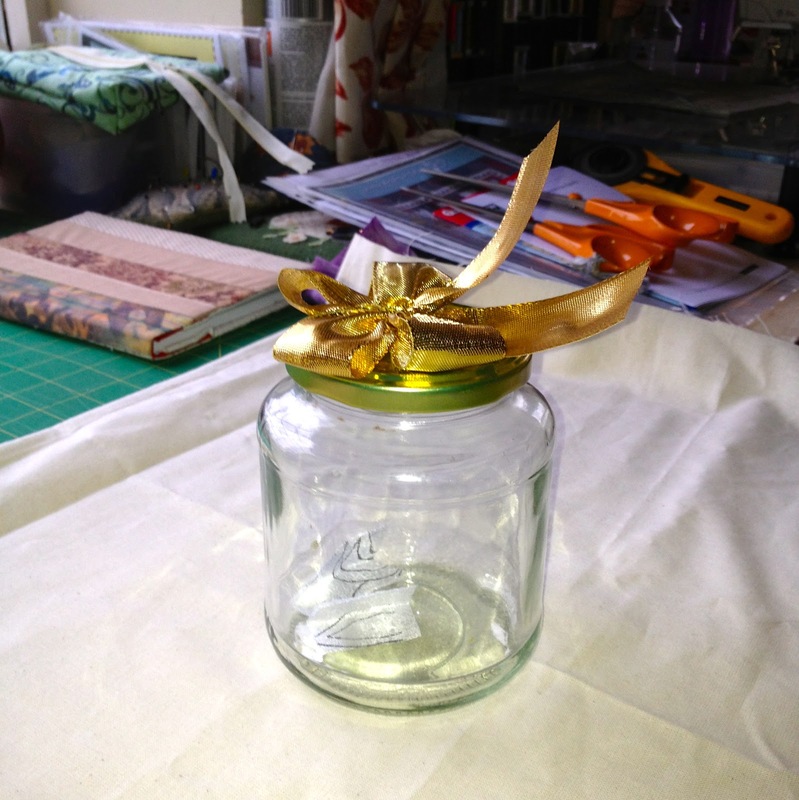 I found this great tutorial on the net and I was going to link to it on this blog for you all to see, but I seem to have lost it. I was blog hopping as you do and for the life of me where it is now I do not know. I did take photos of some of the steps as I made the second one, to remind me how they were made. So I will try and sort you out a tutorial of some sorts tomorrow, or who knows I might even find the original. 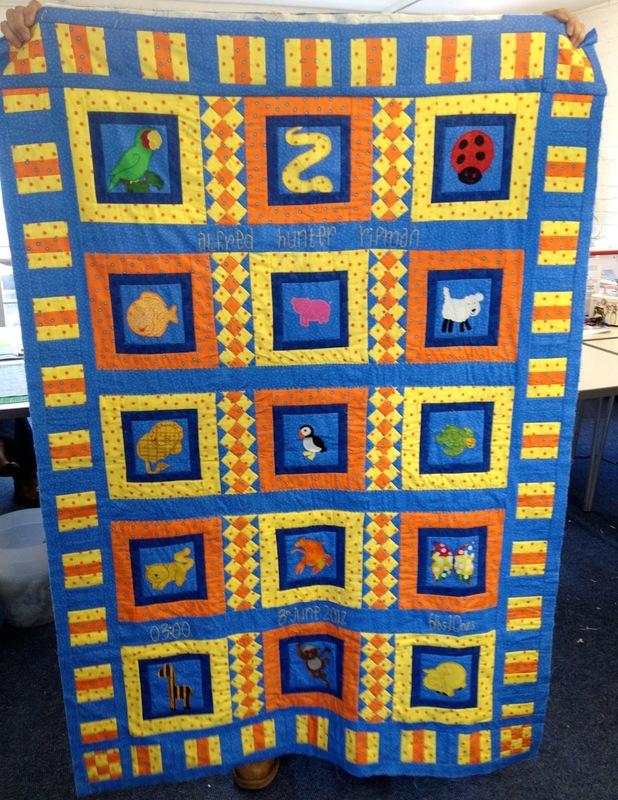 No Quilting Bee this week. There was no quilting at the Bee this week. It was cancelled due to the weather conditions. 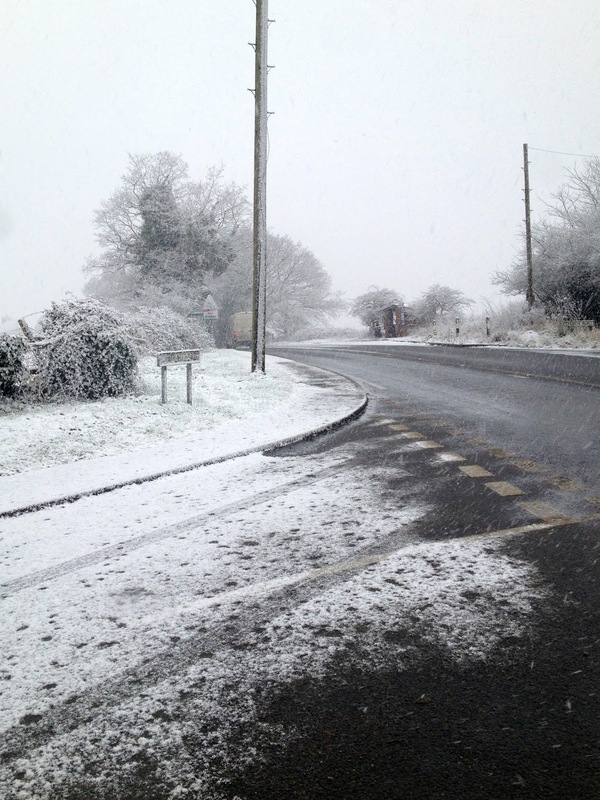 Lots of the girls live out in the sticks, so journeying to Wickham Market was a non- event. Several of us have skype so have kept in touch. Every one is cooking comfort food and getting some of their hand quilting done. 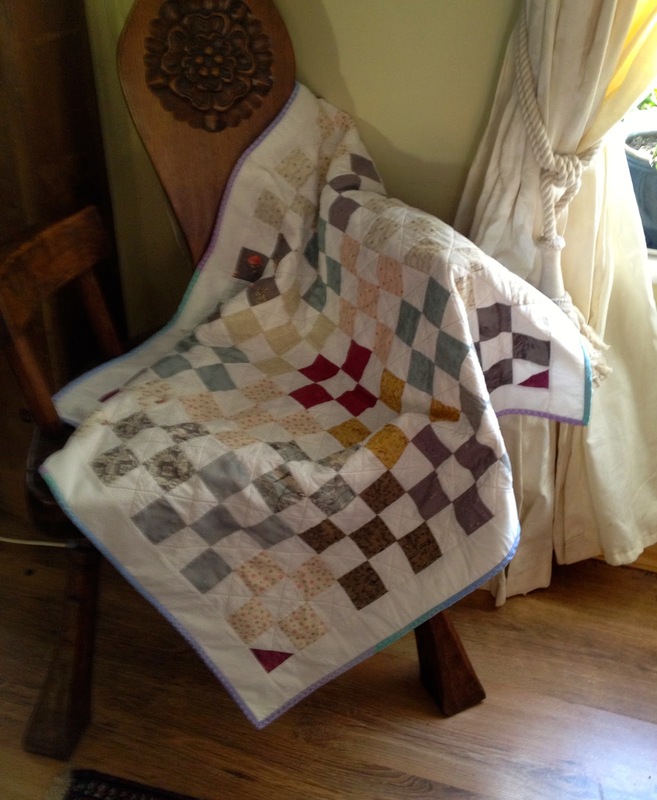 What could be better than sitting by the fire with a quilt over your lap, hand quilting. making Butternut squash soup for lunch and putting a casserole in the oven for tea. New Book with scrap wool. Well you know me. Straight to my knitting basket to try out a little project. I found some scrap alpaca wool from a previous project and decided to start of with a little pair of mittens. Will have to order more wool off Anj if I want to make anything bigger. I have done a little sewing. 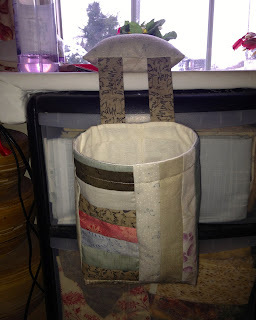 I thought I needed a little bit bin to put all the threads in rather than dropping them all over on the floor and sucking them up the hoover (they always get stuck around the brushes).It sits very neatly next to my sewing machine with its weighted pin cushion (sand) to hold it there, some of you may notice its scrap stripes from my log cabin quilt. 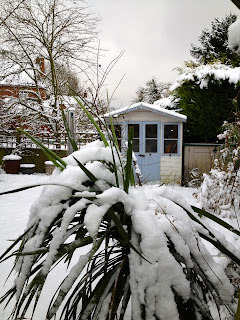 I took a little trip down the garden to look at the snow. It had only been trodden on by birds and looked really lovely. My little summer house looked a little sad though. You might know from previous blogs I sit in my summer house (I call it my shed) in the summer and sew. 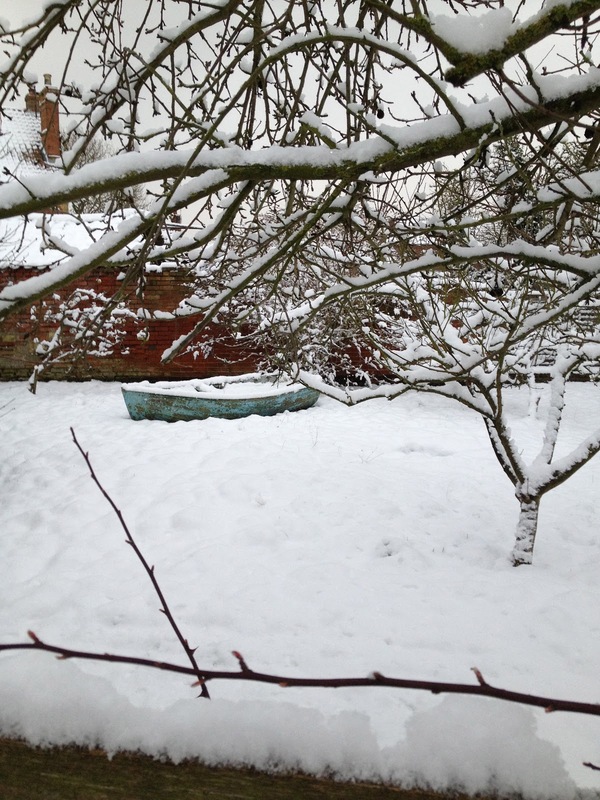 I thought my neighbours garden was rather beautiful though forlorn. I do not really need an excuse to sew, but I do have one this week. It is so cold and miserable outside so definitely no work to be done in the garden. 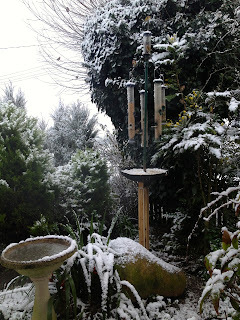 As I am typing this it is beginning to snow. I have a small wood burner in my sewing room, and my lovely husband has kept a good supply of logs coming my way. 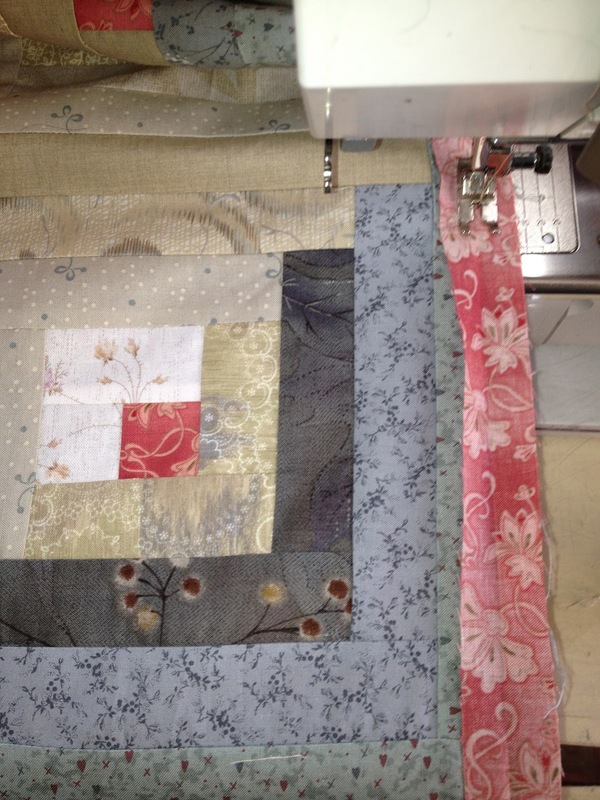 Sewing on the flat crumb catcher. 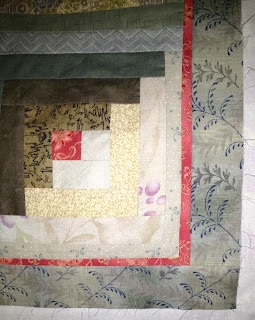 Edge of quilt with borders. I have finished my log cabin top, including the flat crumb catcher and a two inch border. My friend Pam who was visiting, (also a quilter) tells me the American quilters call it a Zinger strip. I suppose it is really a bit zingie! 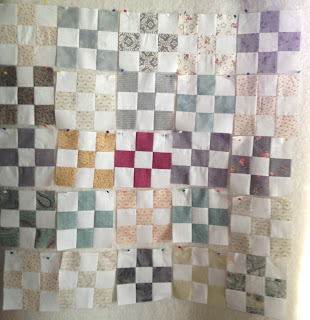 Not able to do any more until I get some backing fabric and Wadding or Batting as the quilters across the pond call it. So I have been a busy bee, pedal to the metal (as Eleanor Burns would say) and made six Birthday presents. The sewing group I belong to has six of the girls all born in February, and we always exchange little gifts, so I am all prepared now. Just have to buy cards. View up the road from my sewing room. This is the view out of one of my sewing room windows. If this keeps up there will be no sewing at the Bee tomorrow, lots of the girls live in very rural areas. so they will not be able to get there. Will write another post if we make it to the Bee tomorrow. It is indeed the first Wednesday Club of the year, it seems a long time ago that we all met up. As you know Wednesday club is held at Quilters Haven our nearest quilt shop. They had lots of lovely new fabrics in stock, but as you know from when I tidied out my sewing room I need do not need fabric, in fact I could sell them some. I did however, buy a new fine line fabric marker pen (FriXion) that you iron to remove. There were 14 of us there in total, all doing different things. I was working on the first of my UFO (un finished objects) which of course is now a WIP. ( work in progress). I started this maybe 2 years ago. It's a whole cloth panel and this is the 5th panel. 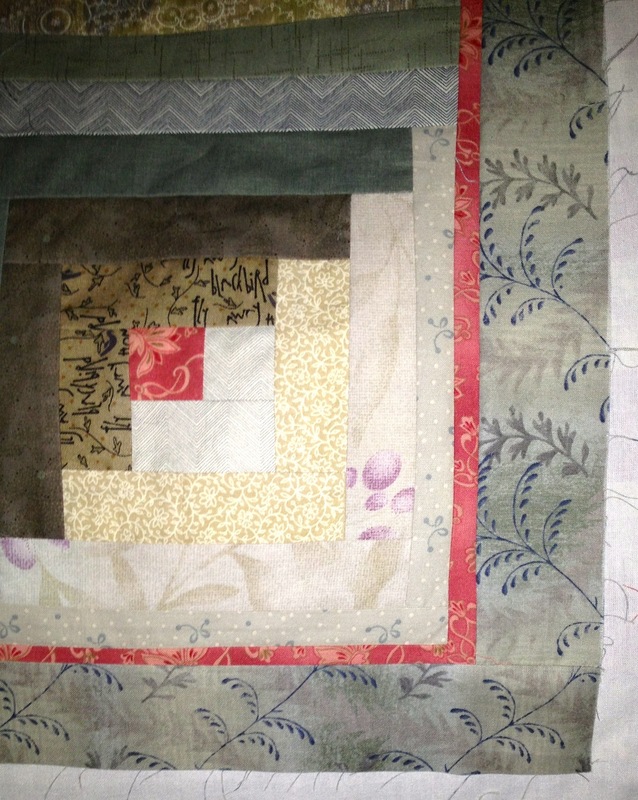 I intend to stitch them together in the "quilt as you go" method. I think I need 9 panels before I add borders. It's very relaxing and something I can do on the go as the panels are 20" square. Annie was busy making tiny Bargello strips( she likes tiny fiddly things) Look at her sewing basket under the table, also tiny blocks. I think these were going to be a Tea cosy. 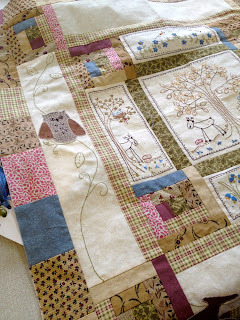 I just had to take a picture of this, Pippa was making a pieced border for her quilt and had laid them all out on her table, they were all so neatly pressed. I will show you the quilt when it is finished. It's lovely so far, and all recycled fabrics. Much laughter was had and mainly at Jenny's expense again. 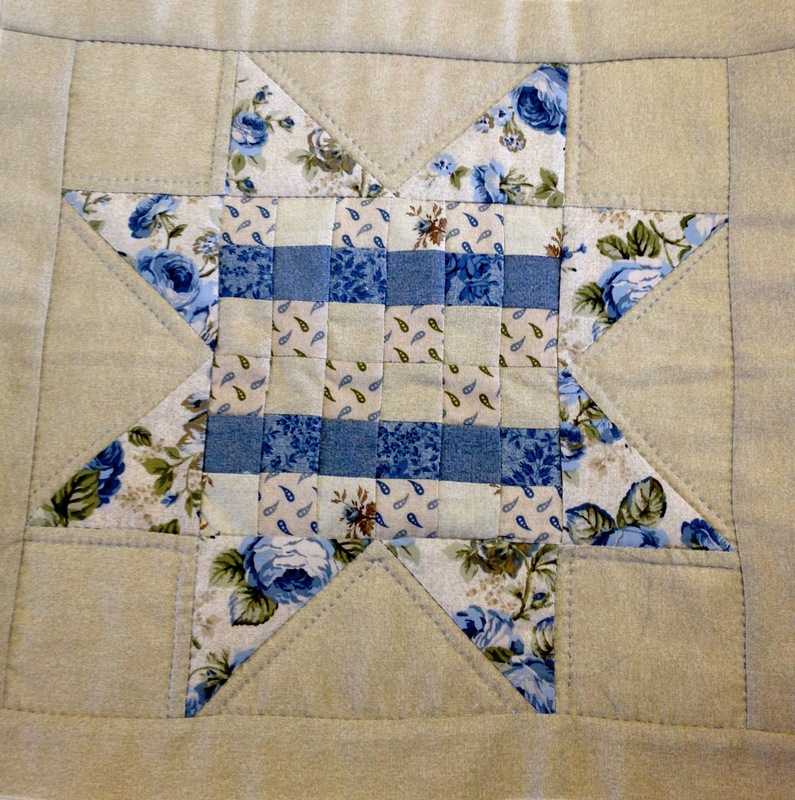 She was making her star block with her scraps from her Friendship quilt but it did not help that the pattern she was using had a page missing. Then sewing the final strip on she put it on back to front. We did laugh. Sorry, Jenny. Her finished block was lovely. Off to cook healthy lunch. Keep safe and keep stitching........Doti..
to all my friends and readers of this blog. Today we have taken down the Christmas decorations, and as I am pleased to get part of my sewing room back, mainly my ironing area. It is a little sad to pack them away again for another year. I want to tell you about some thing my friend Debs shared on Facebook, you find yourself a screw top jar and when good things happen to you, or that make you LOL, surprise gifts, accomplished goals, memories worth saving, daily blessings or are just lovely times .Write them down on a small piece of paper, fold them up and pop them in your jar. Then this time next year, open them up and have fun reading and remembering all the lovely things that happened to you in 2013. My Jar complete with bow, only two folded papers so far. I thought this was a lovely idea and my husband is going to join me too. Watch this space. but I wanted to learn that rocking stitch that a lot of hand quilters use, but believe me it is not easy. In fact it is quite hard and this is going to take some perseverance on my part. Another space to watch.Ha! 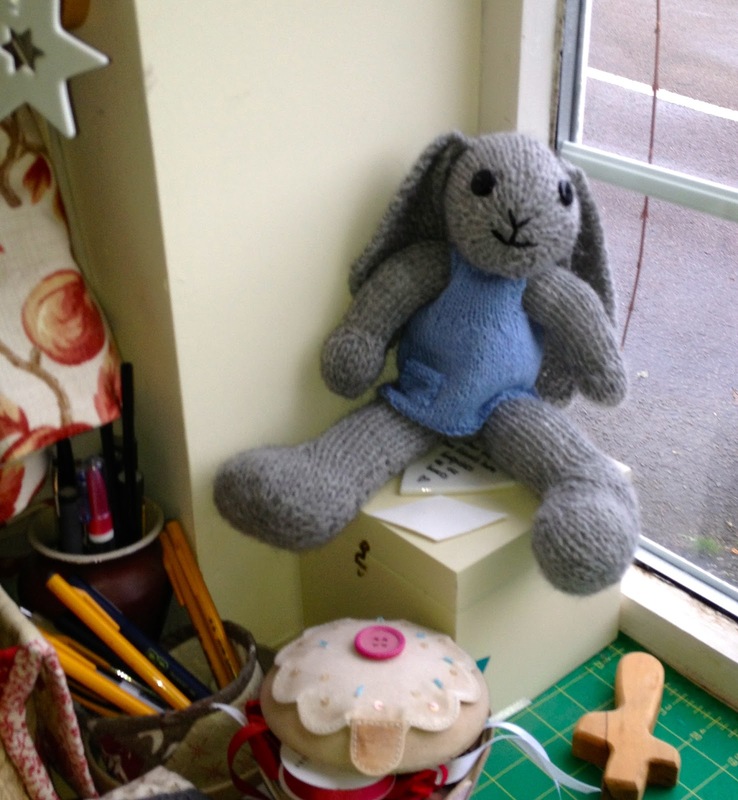 I still have Bertha Bunny who I made just before Christmas, and I am afraid I kept for myself. I have moved her off the sewing machine, and she now is lolling on a lovely box watching all proceedings. "People walk through our lives but only friends leave footprints on our hearts"
I store little precious things in this box, and I love the saying on the top. Now to get some sewing done. That is not a large cup cake, its my ribbon box. Keep safe and keep stitching....Doti..